“I find it harder and harder to know where literature ends and life begins,” Christopher Morley once said. 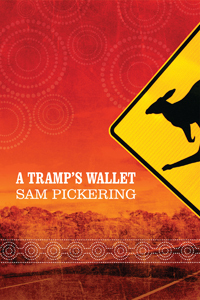 In A Tramp’s Wallet, Sam Pickering spends six months roaming Australia and New Zealand, tramping landscapes pocked by sheep stations, mountains rip-rapped by scree, art galleries and bakeries, and always libraries, their dusty shelves troves quick with life and literature. Pickering lectures on a cruise ship, travels the Murray River on a paddle wheeler, and rides the train from Sydney to Perth across the Nullabor, the land of no trees. He describes “galores” of gardens. His eyes climb forests of trees: mottled river red gum and arthritic sandalwood. Birds more lyrical than poetry flutter through his paragraphs, magpies, rainbow lorikeets, and candied pink galahs. Kites whistle beyond margins, and gannets dive like carets through paragraphs: His mind is an odd place peopled by crowds, some folks actual, others fictional—a man born with a wooden leg and vagabonds who invite him to tour New Zealand on a fiftyyear- old bus lobbying “to free marijuana.” The saunterings of one of America’s best and most popular essayists stretch the seams of A Tramp’s Wallet. Far from the hoes and saws that prune days into convention, life flourishes, and this book is weedy and rankly rich with thought and description. “lord,” St. Odo of Cluny said on his deathbed, “I have loved the beauty of thy house.” In A Tramp’s Wallet, Sam Pickering records his love of that house, and, if truth must out, his love for a few neglected out buildings—barns and backhouses, even the ramshakled huts of thought. A Tramp's Wallet follows a vagabond's adventures as he spends six months roaming through Australia and New Zealand, having adventures and seeing the countries. From lecturing on a cruise ships to riding trains cross-country and seeing rainforests, Sam Pickering provides a lively account of his encounters with strange animals and unusual peoples, and is a fun, lively guide for any seeking armchair adventure.